Frankfurt - Borussia Dortmund could equal their club record of four wins from their opening four Bundesliga fixtures when they travel to Eintracht Frankfurt on Sunday evening (kick-off 17.30 CET). 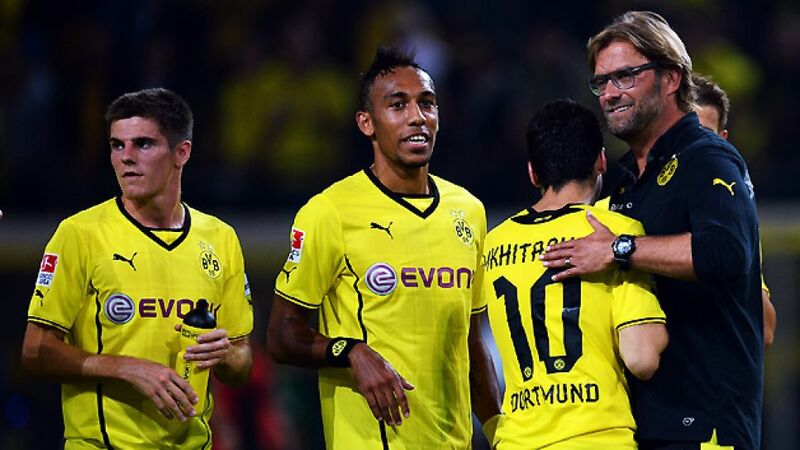 Jürgen Klopp's team let a 2-0 and 3-2 lead slip in a thrilling 3-3 draw at the Commerzbank Arena last season. They are likely to face another stern test this time around, with Frankfurt on a high after qualifying for the UEFA Europa League group stages in midweek. Frankfurt boast a strong home record against Dortmund, winning half of their 40 matches on home soil against the Yellow-Blacks. But while Klopp's side enjoyed the week off, the Eagles were busy sealing their place in the UEFA Europa League group stage against Qarabag FK. "We have always hoped for an advantage against clubs who have to play in Europe in midweek," said Armin Veh. "Now the shoe is on the other foot. Our opposition had the whole week to prepare for this game, while we had a match to play. But we're looking forward to the game on Sunday." Alexander Meier is Frankfurt's main injury doubt for the game. The 30-year-old, who scored against Qarabag on Thursday, was taken off after 70 minutes of that match with a thigh injury. Veh refused to rule him out of Sunday's encounter, however. "We aren't yet sure, but there is a chance he'll play," he said. Johannes Flum, Sebastian Rode should be fit despite picking up knocks in midweek, but Srdjan Lakic remains sidelined. BVB have no fresh injury concerns ahead of the game. Ilkay Gündogan's recovery from a back injury is taking longer expected, while Lukasz Piszczek remains a long-term absentee following hip and groin surgery. On a positive note for BVB, Marco Reus , Sokratis, Sven Bender and Pierre-Emerick Aubameyang are a likely to feature on Sunday evening. Dortmund were handed a tough group in the UEFA Champions League draw this week. BVB will face Arsenal FC, Olympique de Marseille and SSC Napoli in this season's competition, but Jürgen Klopp had no complaints with the outcome of the draw and is aware Sunday's opponents will be confident following their own European success in midweek. The Eagles may not have had the most spectacular of starts to the Bundesliga season, but Klopp is certain his side will face a tough opposition: "I think it will be a very intense game," he said. "We are up against a huge amount of excitement following their Europa League win, but we're going there to get a result that will give us points. We will have to work hard for every advantage."